Kim Høltermand navigates his world as if he’s the last man on Earth. He records built environments, simplifying the buildings and structures that interest him down to their simplest geometric elements. Wrapped in an atmospheric stillness, he removes all signs of passing from his subjects and hints at human intervention without ever allowing us to witness interaction. He leaves only symmetry and form. His natural environments echo only stillness; he captures timelessness, uses water to reflect organic forms to suggest a higher, more ordered consciousness is at hand. His work allows us to see these forms as does their architect, whether that be through the eyes of the men who planned them or through the processes of nature and time. 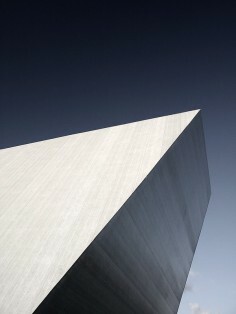 From his site: Born 1977 Kim Høltermand is a freelance architectural and landscape photographer from Denmark. Kim was born into a creative family with both his father and grandfather being artists; his grandfather once worked as an architect. In addition to his burgoing career in photography which only began a few years ago, Kim Høltermand’s day job has him working as a fingerprints expert in the Crime Scene Unit of The Danish National Police. De très belles expérimentations photographiques sont à découvrir sur le portfolio de l’artiste Kim Holtermand. Une recherche architecturale qui fixe les espaces urbains pour les transformer en compositions graphiques. Понравились минимализм фото датского фотографа Кима Холтерманда. Автору удается запечаталеть на своих снимках не только изображение, но и атмосферу тишины и покоя. Ким Холтерманд (Kim Høltermand) независимый архитектурный и ландшафтный фотограф из Дании. Ким родился в 1977 году в творческой семье. Его отец и дед были художниками. Дед также работал архитектором. Свою профессию фотографа Ким успешно совмещает с профессией эксперта по отпечаткам пальцев в датской национальной полиции. Ким делает снимки для таких брендов, как: HTC, Cartoon Networks, Turner Music, Adult Swim, Phaseone, Régime, Radio 24/7, DEVE Architects, Tru Media Productions, WE DO VOODOO STUDIO, Bosideng, Aether Apparel, The Winter Tradition, Enno Bunger, Behance Network, Todor Kobakov, NovoZymes, Gr_Consult, Nilfisk, Manifesto Music, Fibreshield ®, VMware, Infiné Music, Schuberg Philis, Copenhagen Cleantech Cluster, Robot Elephant Records, Pantofola d’Oro, Amanda Levete Architects, Erik Magnussen Design, Engelbrechts Furniture. Его минимализм фото печатали следующие журналы: BG Magazine, HOUSE Magazine, Foto Magazine, Breakthrough Strategies Overcome Creative Imagination by Alex Cornell, Utopia by Cartiere del Garda, Port Magazine, Ideacity, Echoes of the Future by Gestalten, KØBENHAVNER, Lemonade Magazine, Plan Libre Maison de l’Architecture Midi-Pyrenees, Süddeutsche Zeitung, BIG BANG Book by Das Büro, BITE Magazine, Lamono magazine, Nikotine Magazine, Photography Monthly, Nirvana Magazine, EYES ON Magazine, CityVision Magazine, Architecture d’Aujourd’hui (AA), Dwell, EMPTY Magazine, Plugzine, Jyllandsposten, Baumeister, D-Mode, Migrate Magazine, Boxhorn BX22, Grafik Magazine, Esper Magazine, Process Journal, Politiken, Boligmagasinet, C-Heads Magazine, Euroman, MagMag, CarneMag, Candy Magazine, Page. The Magazine, KISMET Magazine, The Hub Magazine, WHOA Magazine, 2010 Semi Permanent Book. 2009 ‘Good Stuff!’ at DASK Gallery in Copenhagen, Denmark. Особого внимания заслуживают интерьерные и архитектурные фото этого автора. Уверен, что если бы ему доверили отснять фотосессию про салон красоты марьино, то это был бы настоящий шедевр.